Morrissey must have big balls. Big brass northern balls. I grant you, this is a fairly odd way to start a review. My current slightly loopy demeanour is a result of sleep deprivation. I got home not particularly late after the show but just could not get off the high. I’m finding it increasingly tough to wind down after I get home late, and there’s a sliding scale. If I’m out for dinner I’ll get home early and usually I’m fine. If I’m at a gig and I get home by 11, which is fairly rare, that might be fine too. If I get home from a gig near midnight I might try and stay up for an hour but not go online so it gives me the best chance of dropping off. And then there’s Morrissey. I got home at a reasonable hour, just before midnight, but couldn’t resist spending an hour online, messaging and checking Twitter and watching clips and generally indulging my Moz glow. And it screwed me up for sleeping beyond words. My heart was pounding and wouldn’t slow down. I was humming with vibration. My mind had songs playing in it like a jukebox. Finally, at nearly 5am I passed out. I woke just before 10 and now here I sit, at 10.30, trying to find a way to describe what happened. This shouldn’t be new. I’ve seen Morrissey 14 (I think) times now. I’ve written about him before. And god knows I’ve heard better setlists, at least I think so, but I suppose it depends on your criteria and interest levels in the varying periods of his career. And yet somehow, somehow, somehow I have rarely seen him do a better show and never felt more in love with him than I do at this moment. How did he pull off this magic trick? To play his new album in near-entirety and still have the biggest audience he’s ever attracted in London in the palm of his hand? I’ve spoken before about how, and this is not to cause offense or make musical comparisons, he has a surrogate Bowie effect on me and my fellow Moz traveller. We never saw Bowie live together and so somehow he has taken on this mythical quality as a performer, someone I speak about in both boastful and grateful tones, recognising how monumentally lucky I was to, as it were, follow him around Europe (and to New York) on the Reality Tour. 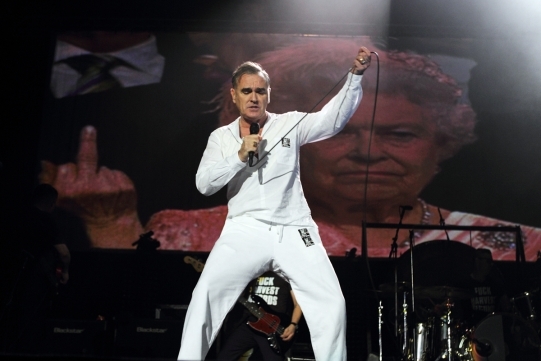 I’m not comparing him to Morrissey as a performer – they are so very different. But that intangible quality, call it an aura if you like, is something both have a ton of (alright, Bowie has more, for the record). I can be front row, or in the swaying, violent semi-moshpit, or at the side craning my neck, or half way back so he’s nearly a dot, and the same thing will happen every time. You fear he’ll let you down and he doesn’t. And then, when he doesn’t, you think, well of course you wouldn’t let me down, let us down. You would never do that. It’s a complex relationship and it can’t be compared to anything I feel for anyone else now, not even Bowie. I have seen Morrissey deliver songs (never perform; he says: “if you have a true and physical need to sing a song then you are not performing. Performance is forced and artificial, and you are either a singer, or else you are... simply ... a costume”) from every album, band and solo, that he has in his arsenal. But last night he started and then ended with a pair of songs everyone knew, but somehow managed to make everyone embrace the fact that the songs between those four were largely unknown. And we loved him for it. And Twitter, the first place any complainer goes, you best believe it was unanimous in love (I said love L-U-V, as the Dolls go) for him. He played 20 songs (that’s a lot for him, he usually does a few less) and of the 16 in between the opening pairs he started with three from his new record in a row. Then I’m Throwing My Arms Around Paris, a thoroughly average song from his last album. Then three more new songs, again in a row – I must confess to thinking that the lyrics are somewhat lacking on both World Peace… in general and on its adolescent title track (it’s the kind of impractical idealistic ‘don’t vote, viva la revolución!’ nonsense you hear from Russell Brand – this is not a compliment). He can do so much better. But just when you think ‘get on with it’ comes the extraordinary obscurity Trouble Loves Me, more of which later. And then, yes, another couple of new songs. At this point I’m amazed that he’s making no concessions to nearly 20,000 people, almost all of whom must be there to hear the hits. It’s nearly Dylan-esque in its contrariness! And what happens next? He goes into the dirge-like raw brutality of Meat Is Murder, a song still so shocking and powerful nearly 30 years after its release that has converted more humans to vegetarianism (myself included) than any other piece of art yet created. He prefaced it with: “I read the other day that 75% of chicken sold in the UK is contaminated, therefore poisonous - and I thought to myself ‘ha ha ha ha!’ (Not entirely true: there is a toxic bacteria in most chicken, true, but it gets destroyed during cooking, so unless you’re eating raw meat… never let the facts get in the way of a good story; as Tony Wilson said: print the legend). He accompanies the song with a video of vivisection, factory farming, caged animal slaughter and torture, which everyone is forced to watch, while bathed in red light, and it makes the entire audience feel sick and disgusted. And we love him for it. It’s a prestige the like of which Houdini would be proud. Also bear in mind that he had commanded the O2 to cease selling any meat products on the night of his show – an unprecedented request to which, incredibly, they agreed. They must have lost money but did it anyway. Incidentally, he’d also previously gotten the Staples Center in LA (where he’s a god, basically, and can sell out arenas with ease mostly due to his rabid Latino fanbase) to do the same. They had already said no to McCartney. These are more useful victories derived from the small amount of power he has than being snooty about the political process, if you ask me. So then, yes, you guessed it, a trio more of new songs (and oh the irony, my favourite new song, Oboe Concerto, is not played). The main show ends with another wonderfully obscure non-hit, Speedway, the song from which I have taken my lyric tattoo design, and we’re finished. Encore. The end. And people are going absolutely mad. They’re throwing flowers they have brought at the stage. They are throwing themselves at the stage, just trying to touch him. This is normal gig behaviour at his shows and nowhere else in music have I seen it – weeping humans of all shapes and sizes and genders and ages and sexualities simply prostrating their bodies to him to touch and, one imagines, be healed. Each touch of hands provokes a roar. You’re cheering for each human who needs, just needs desperately, to feel his touch because they are you. The setlist and its 11 new songs are a marvel, a miracle (with I’m Not A Man and Istanbul working particularly well). I’ve heard him perform everything you could imagine, from How Soon Is Now? to This Charming Man. From Death Of A Disco Dancer to Last Of The Famous International Playboys. From There Is A Light That Never Goes Out to Please Please Please (Let Me Get What I Want). From Last Night I Dreamt That Somebody Loved Me to Panic to Girlfriend In A Coma and so on and so on and so on. This man has 100 songs to spare. He could perform any of his albums in entirety. Until last night I had heard 72 different songs – it’s now 84. And in researching my own Moz history just now I realised I’ve seen him 15, not 14, times (not counting that Roundhouse one where his voice gave out after three songs and the gig was abandoned). I saw Bowie 16 times. He’s getting there. I’ve had to wait two years for this 15th show, mind you. I have to hope he has many more in him. Remarkably, I cannot remember his voice ever sounding this good. He seems to be either dreadfully unlucky or prone to health issues, which he has recently alluded to without properly discussing, and why should he, as his health, like world peace, is none of my business. And yet, he looks great, muscular and determined and ornery as ever. As one might expect, he’s lost none of his tendency to confront, which feels oddly comforting. Without perceived injustice (the charts, record labels, hunting, animal welfare, the Royals, celebrities) who would he even be? We’d managed to engineer a pretty perfect show day, it must be said. This despite the fact that I’m suffering from a trapped sciatic nerve and can’t stand or walk for more than five minutes at a time. A lovely day in the pub, then a sobering-up dinner and then a spot by the mixing desk. My location on the arena floor was not at all how I planned it. Pre-nerve-injury I was so very up for being front and centre, right in the pit. I was pretty gutted, in all honesty, about having to abandon that plan, having waited two years to see him live again. I held up pretty well in the end, despite having to spend some time crouching on the ground or bent at the waist to stave off the pain. I didn’t care. He was singing to me, he was mine again. My love affair with this Mancunian hero had started eight years ago. I liked him fine before then, I knew what The Smiths meant, but he hadn’t found me as a solo artist. One night – May 1st 2006 – at Alexandra Palace changed all that and since then… god, he gets on my nerves sometimes, with some of the outlandish nonsense he says. But I always forgive him, why? I understand him, through all the madness and militancy and attention seeking and drama. Dressed in your mother’s bridal veil? I said: "That’s nothing - you should hear me play piano"
People have been sent to the Tower, frankly, for less. The crowd roared every word and we jumped and danced and punched the air and the entire O2, filled to the brim, realised we were in the presence of perhaps the greatest living Englishman, certainly the greatest one currently touring! A sweet nostalgia blast, next up, was Suedehead, his first solo single, which was surely the moment post-Smiths breakup where everyone had gone, aha, he doesn’t need Johnny to write great songs. Of course, there are many arguments to be made about the relative quality, similarity and lack of adventurousness in some of his solo output. However, he’s a pop artist and he makes pop songs because that’s the music that mattered to him when he was growing up. The (older) lyrics may be sophisticated but the music is not – and who cares? He’s not avant-garde and nor does he care for it. He likes crooners and pop music and his subversion lies in the words and persona. It is telling that this morning’s reviews make reference to his attacks on the Royal family, the meat industry, the government and his own record label. The Telegraph even makes hay out of his recent health issues, which he hasn’t discussed at all coherently. Talking of Asleep, they went full on: “Dimly lit, face obscured, it felt like he was delivering his own eulogy, made even more poignant by his health problems.” Please. Really? As if any of this were newsworthy somehow – unusual proclamations and events are just par for the course at one of his shows. Rarely do artists say or do anything beyond what is expected of them at a performance, and certainly even fewer challenge their own crowd between songs to think about animal welfare (we sing happily: “Hooray, hooray, the bullfighter dies, and nobody cries”) or the nature of how record labels shaft artists or the love of hunting demonstrated constantly by a bunch of toffs we all pay for. That’s just him. He has said he is only controversial because it’s so easy to be controversial in pop music: nobody ever is. Most of the reviews I’ve read have called the show ‘emotional’ – to which I reply, when is he not? Seeing Morrissey live is always a moving experience, otherwise we wouldn’t do it. So after Suedehead off we went for an hour of 11 new songs and an animal torture video. But in the middle of it all, as my pain kicked in and I started to flag, out came Trouble Loves Me. From 1997’s fairly forgotten Maladjusted, this one is an epic Bond theme of a record. I’d heard it live once before, the first time I saw him, and I didn’t know it then. But I can pinpoint it as the song that made me fall for him, this Hulmerist, flaws and all. And so we sang and swayed arm in arm and it was overwhelming. So, right now, I am exhausted and starting to feel emotional about the night. I must wrap up. I cannot imagine what life would be like if I didn’t get to be in a room with that man every so often. He has come to mean so much to me. In between the times when I get to see him live I’m challenged by much of what he says – his own sometimes-muddled naïve invective, the abuse for loving him that I receive from acquaintance and stranger alike… I sometimes forget why I like him at all. But seeing him live reminds me, so perfectly, why he’s worth every second of my time. It fills you up, somehow, until the next show. It always feels like a re-acquaintance – never a goodbye. You could feel the emotion coursing through the venue. You could hear a pin drop. He won over every person there, with a couple of old songs and a ton of new ones. His first words to the crowd were “I am privileged beyond my wildest dreams.” His last, delivered with a dramatic flourish, as ever, were “Remember me. Forget my fate” (a quote from Purcell’s opera Dido and Aeneas). And then, the last song was with us, the ubiquitous Everyday Is Like Sunday, greeted like an old friend. The lights came up and Klaus Nomi’s aria Death (from Dido’s Lament, also, of course, from Dido and Aeneas) ushered us out into the cold night. People sang his songs as we made our way to the Tube, joined forever by this unique human being.